As part of the 2009 New York Electronic Art Festival, a series of Composer Workshops will take place at Harvestworks throughout October. These Composer Workshops have been curated and organized to serve as a catalyst for public discussion, and they are also designed to convey curiosity and imagination as the artists’ play with the creative potential of technology. Saturday 17th October: Beginners — A friendly introduction to SuperCollider for absolute beginners, aimed at artists and musicians. Aside from a little familiarity with the digital arts, no prerequisites, though some prior exposure to computer music (perhaps through Max/MSP or Csound) may be helpful. Sunday 18th October: Intermediate day — Would be suitable for those who have taken the previous day’s beginner workshop, as well as those wanting to refresh or extend their skills. The emphasis here will be on live performance with SuperCollider, and facilitating participants’ own projects. The workshop will be adaptable to participants’ needs, and I will take requests for topics, and run a general question and answer session. Nick Collins has been leading SuperCollider workshops, including annual week long courses, since 2002. He is a lecturer in computer music at the University of Sussex, running the music informatics degree programmes and research group. Research interests include machine listening, interactive and generative music, audiovisual performance, sound synthesis and music psychology. 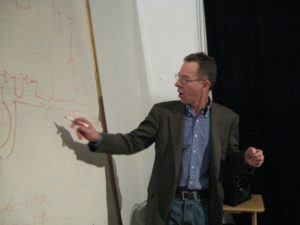 He is first editor of the Cambridge Companion to Electronic Music (Cambridge University Press, 2007), an editor of the SuperCollider Book (MIT Press, in press), and currently working on the textbook Introduction to Computer Music (commissioned by Wiley, due late 2009). Nick has travelled extensively as a computer music performer, with appearances at digital art festivals such as Transmediale and Sonar, and tours on four continents with the audiovisual group ‘klipp av’. With electronic music contacts all around the world, he has just curated the 18th Leonardo Music Journal CD, entitled `Why record?`. Basic Hacking: Alternate microphones (contact mikes, coil pickups, using speakers and headphone as microphones, tape heads, etc. 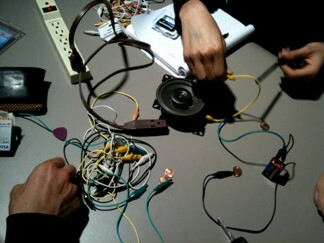 ), Homemade transducers for sending sound through objects for physical filtering (cheap “Rainforest”), “Victorian synthesizer” (making an oscillator with just a speaker and a battery), “Laying of hands” on a radio circuit board (the poor man’s Cracklebox), and “Circuit Bending” (new noises from old toys). Cost: $350 + $25 materials fee. Advanced Hacking: Circuits from scratch: oscillators, tremolo/gate/panner, mixers, preamp/distortion, pitch trackers, weird analog signal processing, sequencers. Nicolas Collins presents two hands-on workshops in Hardware Hacking. Assuming no technical background whatsoever, these workshops guide the participants through a series of sound-producing electronic construction projects, from making simple contact microphones, through “bending” toys”, to making oscillators and other circuits from scratch. The workshop ends with a performance/installation by all participants. New York born and raised, Nicolas Collins studied composition with Alvin Lucier, worked for many years with David Tudor, and has collaborated with numerous musicians around the world. He lived most of the 1990s in Europe, where he was Visiting Artistic Director of Stichting STEIM (Amsterdam), and a DAAD composer-in-residence in Berlin. Since 1997 he has been editor-in-chief of the Leonardo Music Journal. 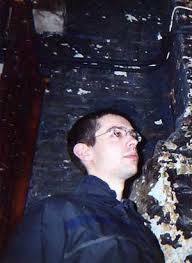 He is a Professor in the Department of Sound at the School of the Art Institute of Chicago. A new edition of his book, Handmade Electronic Music – The Art of Hardware Hacking, will WAS published by Routledge in April 2009. Collins has the dubious distinction of having played at both CBGBs and the Concertgebouw.